Cable TV: Televisions in living room and master bedroom. Full Kitchen: Includes Full size Appliances. Cooking Utensils Provided: Large selection of spices and cooking utensils. Gas BBQ: BBQs located near the parking lot, next to the ocean and near the pool. Lanai (Balcony): Private upstairs balcony off master bedroom with chaise lounge for sunning or reading. Lanai (Balcony): Private lanai off living room with table and chairs for ideal eating, reading and whale watching location. 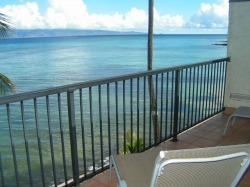 Beachfront: Reef protected sandy beach has gated access. Code provided to guests. Oceanfront: Breathtaking views and soothing surf sounds abound.